Having first ridden the Model T when it was launched back in 2013, we put the latest improvements to Momentum Electric’s step-through model to the test. Ying-Tsao Tan was the product design graduate behind the launch of Momentum’s Model T and Upstart electric bikes. The company’s aim of ‘moving everybody’ meant the design of each bike had to tick as many boxes as possible for different uses, needs and wishes. While the Upstart is a diamond-framed urban roadster with no frills and built for speed, the Model T is aimed at a different market segment, those looking for a more laid back, leisurely style ride. Omitting the cross-bar of the Upstart, the Model T promotes comfort and practicality for all ages and abilities. It is available in two sizes and you can have any colour, so as long as it’s black! 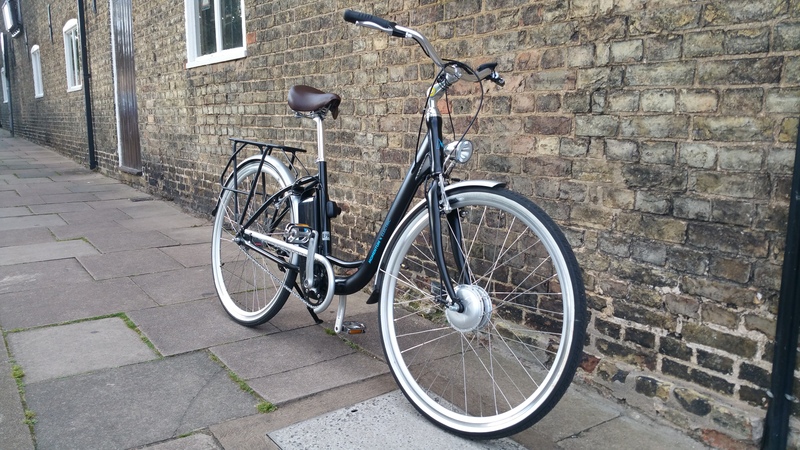 The design has a vintage Victorian, understated look with whitewall tyres, silver mudguards and chain guard. Momentum have also opted for a black rear rack which blends into the frame. 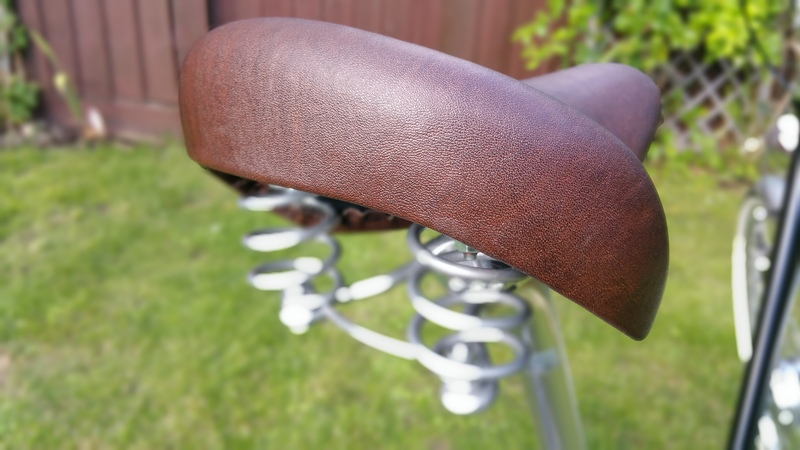 Completing the retro look is a brown leather-effect sprung seat. The overall effect is attractive to the eye, with no lairy colours or decals, just simple and elegant. At first glance, you would be forgiven for thinking that this is a single speed bike. 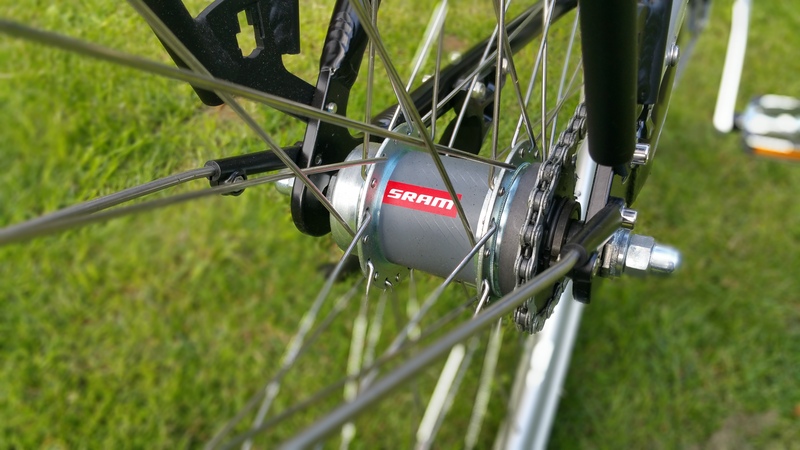 However, Momentum Electric have incorporated an SRAM Automatix hub gear, its unique selling point being that it uses centrifugal force to change gear for you automatically based on your speed. There are two gears, the lower gear being direct drive and the second higher gear steps up to 136%. 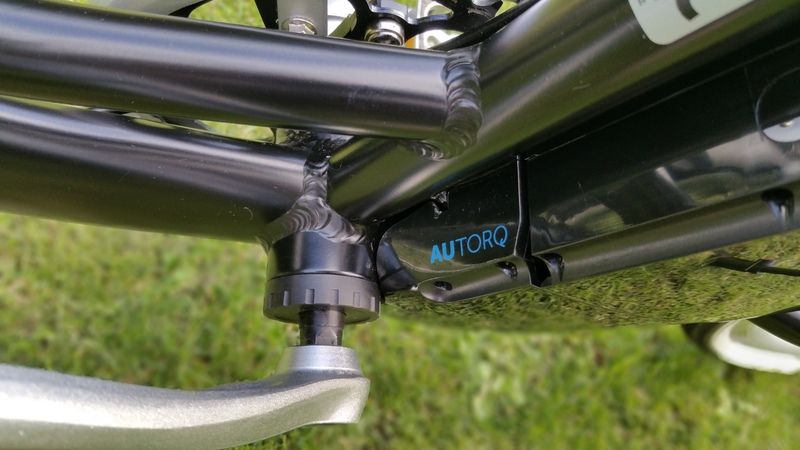 Power assistance is provided by a Bafang 8Fun hub motor fitted in the front wheel that is controlled by Momentum’s AUTORQ (automatic + torque) sensor on the crank. The sensor measures how much power the rider is applying to the pedals, passes that on to the controller, which in turn determines the amount of assistance given by the motor. The Samsung battery sits low in the frame, contributing to a lower centre of gravity for extra stability. The battery is rated at 36v with a 10Ah capacity with a suggested range of between 30 to 60 miles. The only assembly required once out of its box is adjusting the seat height, attaching the pedals, fixing the handlebars into position and a quick tighten using the supplied allen key and spanner. Being a test bike, the battery arrived with only one bar showing so once fully charged I was on my way. My chosen test route to see how many miles I could squeeze from a single charge was to skirt round the side of my home town, Newmarket and over the ‘ridge’, meandering up and down through picturesque Suffolk villages before heading back into Newmarket town centre and then home. This was a good mixture of A and B roads, covering town and country routes, with a few hills thrown into the mix. With a forecast of sunshine and showers, the wind was fairly brisk giving a strong headwind once out in the open countryside. Stepping onto the bike, you’ll notice that situated next to the left-hand grip/above the brake lever is the bike’s control unit. 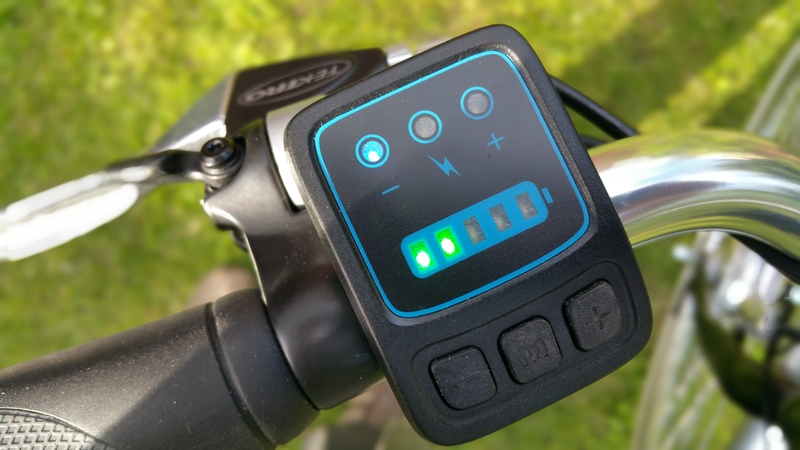 It’s a simple affair with no fancy LCD display, just two rows of LEDs above 3 buttons, one set showing the currently selected assistance level, the other how much power you have left in your battery. 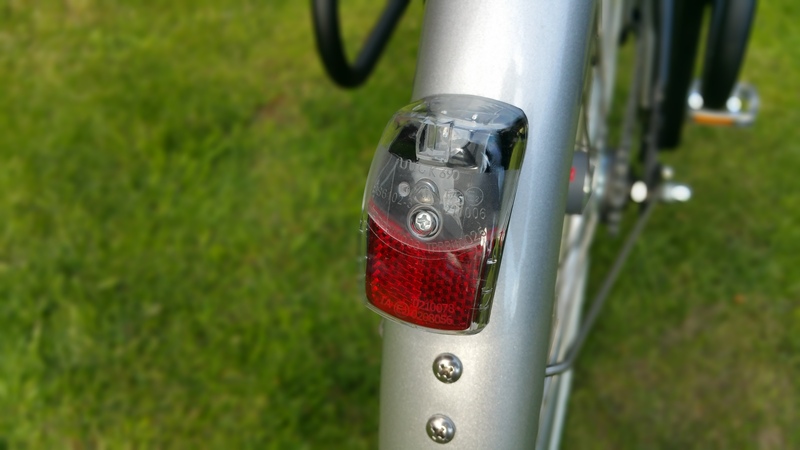 The middle button switches the bike on with the default assistance level set to 1 (the lowest level, bar off/no assistance). Plus and minus (+ -) buttons either side of the on/off button control the level of assistance the motor gives you, ranging simply from ‘low’, ‘medium’ and ‘high’. To get started just begin pedalling and the Model T’s torque sensor kicks in once you’ve made about a 1/4 revolution of the pedals (rather than respond as soon as you touch them). It’s a personal preference thing, but I prefer not needing to pull on the brakes when waiting at traffic lights to stop the bike lurching ahead, for example. 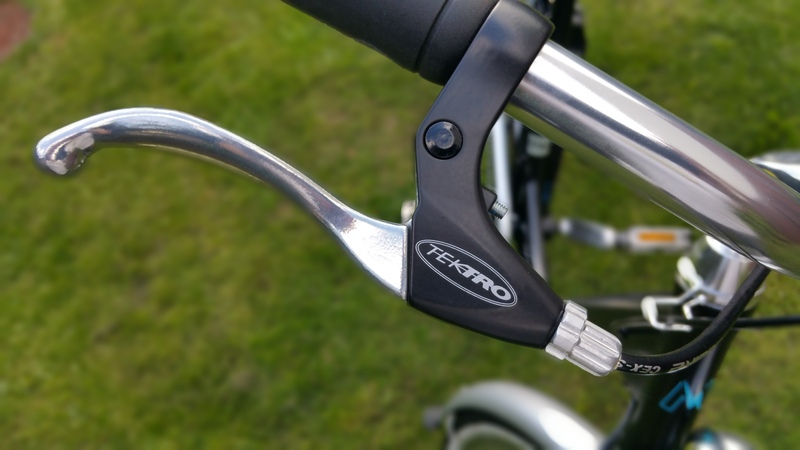 Having a torque sensor does mean you constantly need to pedal since the amount of assistance the motor gives is reflected by how much effort you put in however. For throttle aficionados, there isn’t one, although there is a walk-along mode. The first thing you notice (or not!) 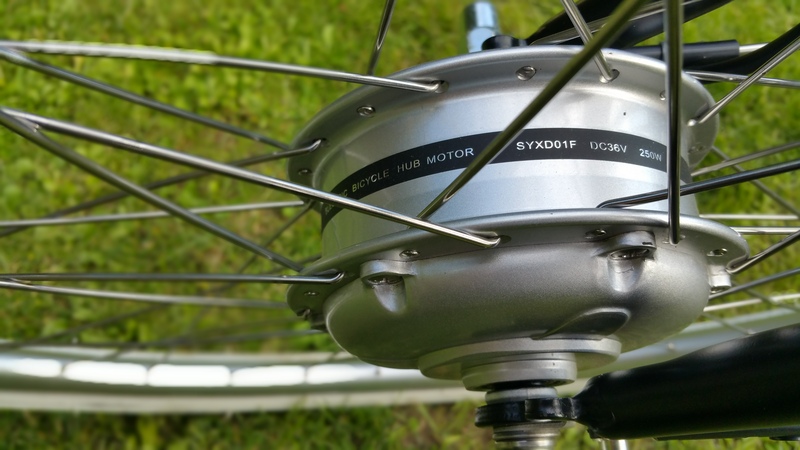 is that the front Bafang hub motor is very quiet, with just a barely audible hum. Acceleration is brisk rather than rapid and once you reach around 11 mph, you’ll feel a brief hesitation as second gear is automatically selected by the Automatix hub gearing. It’s a bit like the sensation of driving an automatic car. It’s very smooth and silent and you don’t have to do anything. Setting off through the village, I found the Model T to have a comfortable, upright riding position and the chunky rubber grips on the handlebars help distribute the weight on your wrists. The bike cruises around comfortably on the flat and the motor assistance maxes out with a top speed of around 17 – 17.5 mph which is thereabouts of the acceptable tolerance range of +/- 10% on the 15.5 mph legal limit. At the maximum assisted speed, it’s good to see none of the lurching or fading sometimes seen in other motors, with the Bafang reducing or increasing its power delivery imperceptibly. After 7.2 miles of mainly flat roads, the first battery level light extinguished on the display. There are 5 lights in total on the display informing you of the remaining capacity of the battery. Skirting round Newmarket and down into Suffolk, the terrain started to get more hilly. Still on the B roads, the second battery level light went out at 13 miles. On the downhill section outside of the villages it was easily possible to out-pedal the limited gearing due to only having two gears – my legs were spinning fast so rather than trying to build as much speed as possible I tend to just stop pedalling and coast down the hill. The bike seemed stable enough though and the rim brakes were fine with only the occasional squeaking usually when the roads were still wet from one of the rain showers. Reaching just over the halfway point in my ride, the third light went out at 19.3 miles so I decided to head back towards Newmarket. Making my way through the town centre rush hour traffic with a number of traffic lights and small narrow streets to navigate, I really started to appreciate the Automatix hub gear. You don’t need to worry about what gear you’re in, or whether you’ve selected the correct gear to pull away again if you have to stop or slow down due to the traffic conditions and other road users. The only downside is that while the change from first to second gear is automatic, it’s not the other way around. 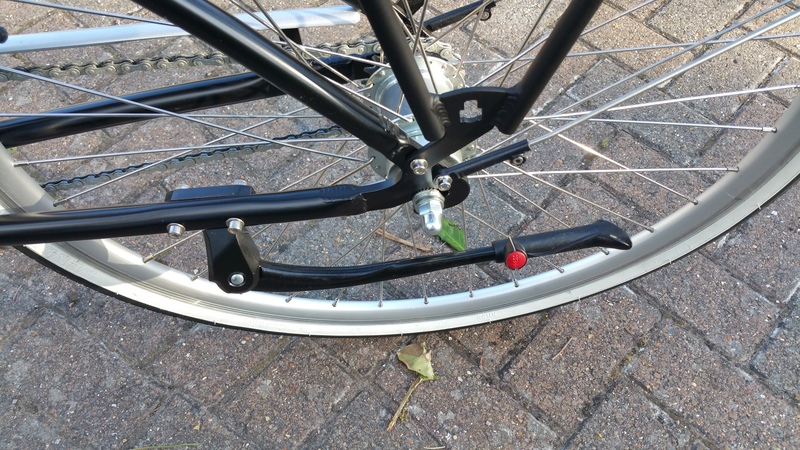 So as you slow down, you need to stop pedalling momentarily so the hub selects the lower gear. However on the plus side, there’s little to worry about, nothing to adjust, no extra cables or shifters and aesthetically, it helps keep the clean lines of the bike. 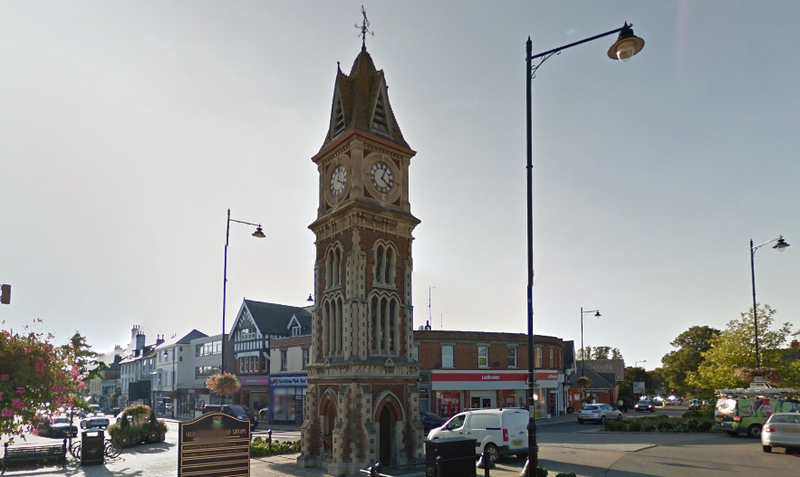 Leaving Newmarket, the fourth battery indicator light went out at 26.5 miles. Being on the final furlong so to speak, I headed towards home and to see how many further miles I could squeeze out of the battery. I found riding along bumpier roads and hitting potholes, the upright position and springy saddle helped offset the Model T’s lack of front or rear suspension. Thankfully it handles well and there was no rattling from any of the components. At 30 miles, the last light on the display started flashing to tell me that I was out of juice. Keeping going to see how much further it would go, the battery finally gave out with all lights out at 32 miles. There is no announcement other than the display unit turning off and there being no more assistance from the motor. 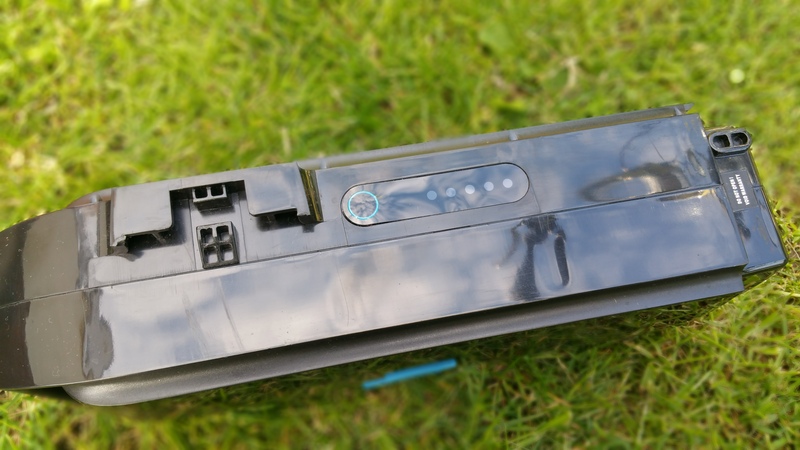 It was possible to turn it back on again and squeeze a bit extra as long as you kept the assistance level to 1 and the speed down – as soon as you put too much load onto the motor, it would switch off again to preserve the battery. Upon checking my ride results with my Garmin GPS, the average speed for the ride was a respectable 14 mph with an elevation gain of about 588 feet. The next ride is to test the Model T’s hill climbing ability and with that, I took the battery off the bike to recharge it ready for the following day. 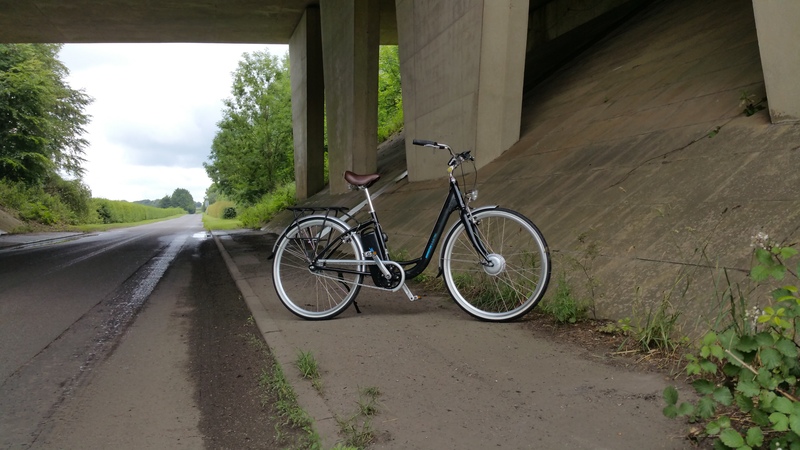 I took the Model T to Hartest hill in Suffolk – my usual haunt for testing electric bikes. 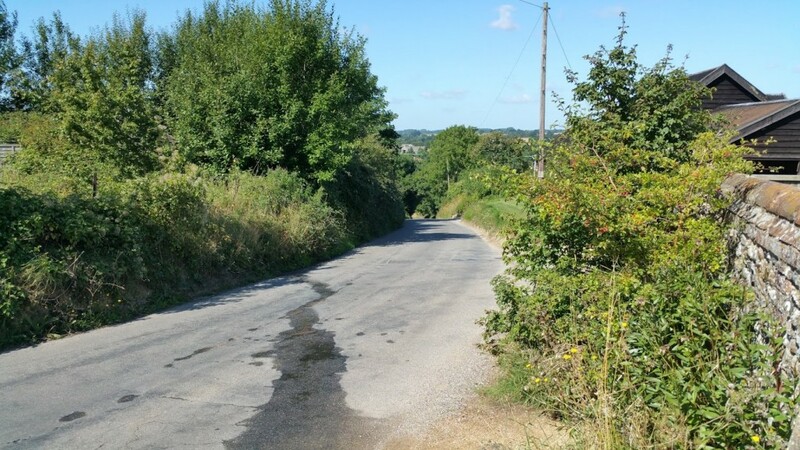 Unfortunately, there are a lack of decent hills in East Anglia and this is probably one of the best, a quarter mile section with a 17% gradient at its steepest section. It’s used a lot by regular club riders testing their fitness and I often come across one or two zigzagging their way up the hill. To test the Model T, I planned to do a few runs up and down the hill, first testing for the maximum speed, lowest speed and maximum assistance. The first test was to approach using maximum assistance, tackling the climb as fast as possible. Starting off from the bottom of the hill at 13 mph, I tried to maintain this speed going up the hill. During the climb the speed dropped to around 4 mph as the motor struggled on the steepest section. Thinking this would be a bum out of seat moment, I was pleasantly surprised that the motor managed to keep providing enough oomph to crawl to the top of the hill. So a good result there, certainly not the fastest bike I’ve tested on this hill, but it made it nonetheless. One thing I noticed is if you’re in the higher gear and your speed drops it won’t automatically drop down into the lower gear. I needed to ease off momentarily on the pedals to get the bike to select the lower gear. For the second test, I wanted to climb as slowly as possible. This time, I approached the bottom of the hill in 2nd gear. As the gradient increased, my speed dropped down to about 3-4 mph. Without easing off the pedalling the Automatix hub didn’t drop to first gear, but the motor still managed to get me to the top of the hill, although with some help from me. Whizzing back downhill between rides, it’s easy to hit 30-40mph freewheeling, but due to the gearing you won’t be able to pedal that fast. Pedalling realistically maxes out at 20-25mph. 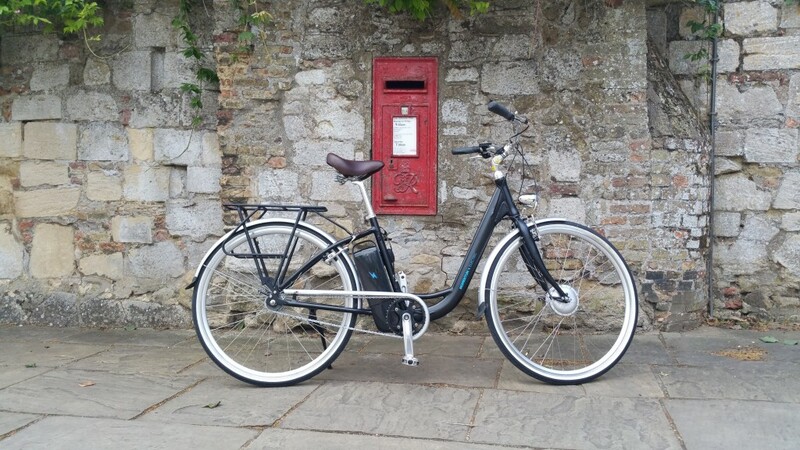 To help combat the typical British weather, the Model T already comes fully equipped with proper silver painted mudguards front and rear, as well as a matching chain guard to help keep your clothes clean and dry. 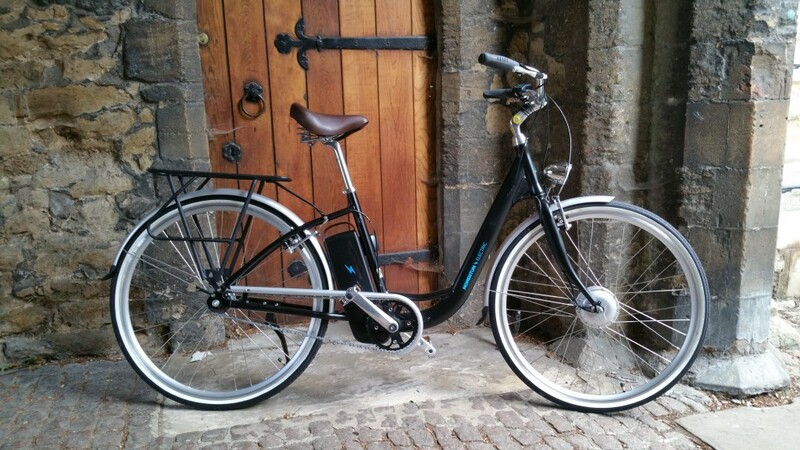 It also comes with a matching black rear rack already fitted, which is rated to 25 Kg. My Ortleib panniers fitted just fine with the rack being far enough back so you don’t catch your feet. 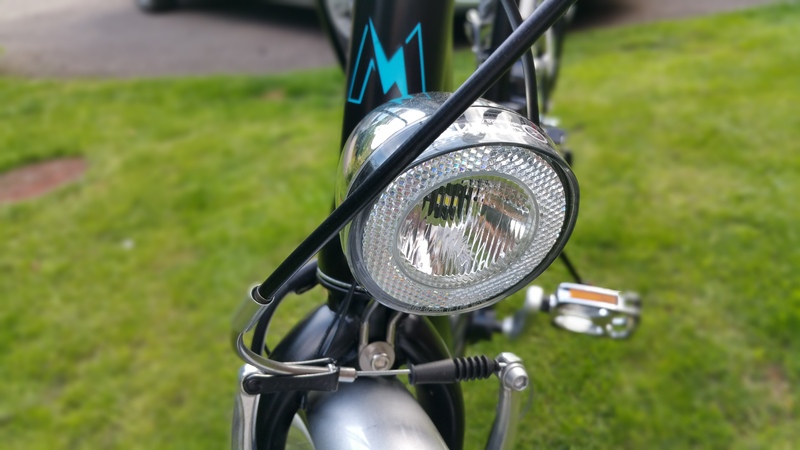 For night riding, there are Spanninga LED lights fitted front and rear and they both run off the bike’s Lithium battery, so you don’t need to worry about buying aftermarket lights and batteries. The lights are easily switched on and off using the the + (right) button and they both come on together. They’re adequate enough for urban use though. As with any other bike, you can always add your own if you need to. 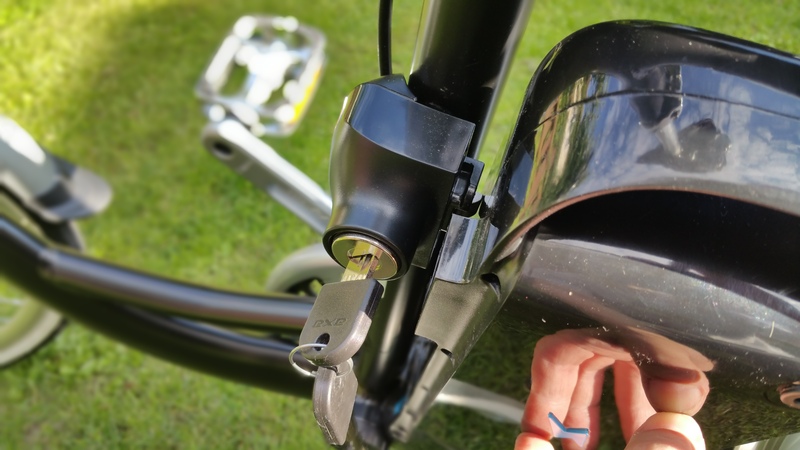 In terms of security, the battery is locked into position when fitted to the bike and you’ll need one of the two supplied keys in order to remove it. There’s a satisfying click as it locks into place and it feels sturdy with no wiggling around. 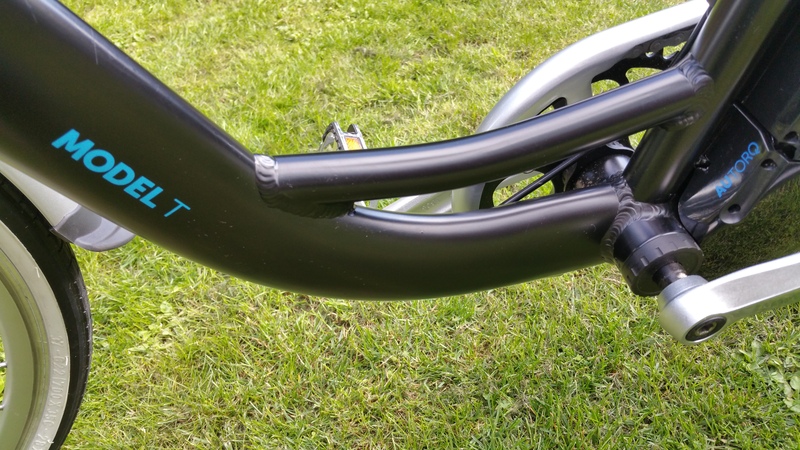 The control unit on the handlebars is not removable, but there is a small push-connector on the connecting cable so it could be taken off if necessary (also unscrewing the bracket). If you’re unlucky enough to sustain a puncture, the motor power cable on the front fork has a push-pull connector for easy removal. Although there aren’t quick releases for the wheels so you will still need to carry a spanner with you. When riding at night, a minor point to be aware of is that the blue LED lights on the control unit are very bright with no option to dim them. On unlit roads, this can be annoying especially as your eyes keep on trying to adjust to the dark if you look down and glance at them. On my test rides at night, I ended up sticking a bit of masking tape over them. The revised Model T has the inclusion of a carry ‘handle’ in the bottom of the frame should you need to lug the bike up some steps for example. Thankfully, the bike isn’t too heavy at 19kg (excluding the battery). Oddly, it actually felt lighter than this! The bike also comes with a stand and there is also a walk assist function which can be operated using the – button on the control unit. It’s good to see the brake cables have been routed through the frame for aesthetics. Also the controller/power cables from the bottom bracket are routed this way. To fit the battery, you go in from the side and then once it connects with the base unit you push it until it clicks with the lock. While you need a key to remove the battery from the bike, you don’t need the keys to be in the lock to fit it back on, which is good. 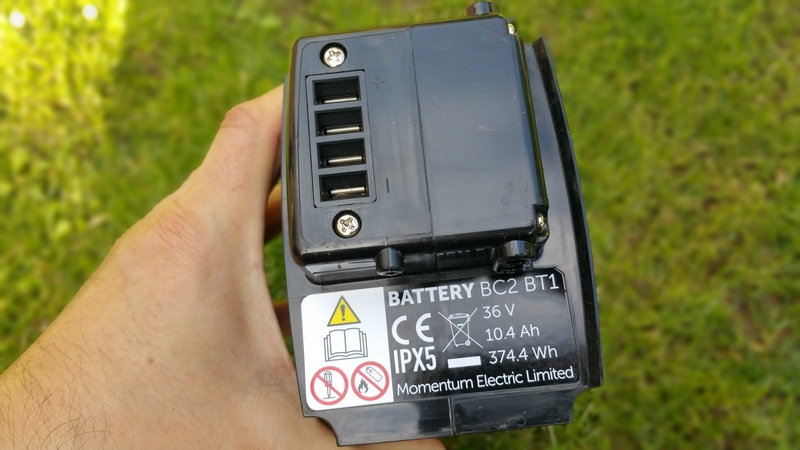 For removal ,the battery does have a carry handle at the top, but just be aware the base doesn’t sit flat on the ground due to the connector so it’s easy for it to topple over. 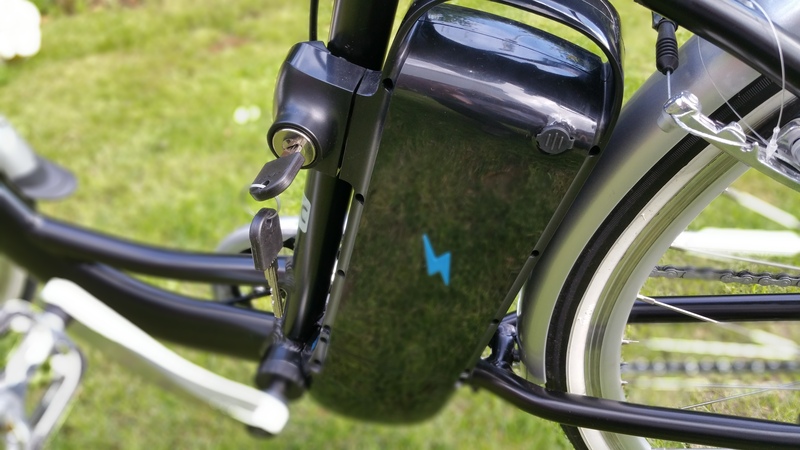 The bike comes with a mains charger and the battery can either be charged on or off the bike. During our testing, a flat battery to fully charged took between 5-6 hours. During charging, the row of LEDs on the battery flash so you can see charging progress and once complete, all the lights on the battery and charger go out. Although different terrains and conditions will affect range, during our testing period we achieved a range of 32 miles on maximum assistance and riding at just under 15mph. That’s about 11.6 Wh / per mile. So while not scientific, I would say around 40 miles or more should be achievable in normal everyday use depending upon your riding style, local conditions and how much effort you’re prepared to put in. There’s a lot to like about the Model T, from the understated styling to the no-frills just get-on-and-go setup. A comfortable seat with a sit up and beg riding position, easy on and off with the step-through frame and quiet automatic gear changing. So with those credits rolling, if you want a no-nonsense bike to run errands, or for an urban commute there is little to criticise. From my experience, it coped well on hills up to 15% or so, if you have any steeper challenges in your locality then definitely take the bike on a test ride up and down those to see how it fares for you. Bear in mind the Automatix won’t change a gear down while there is a load on the pedals, so you need to ease off. 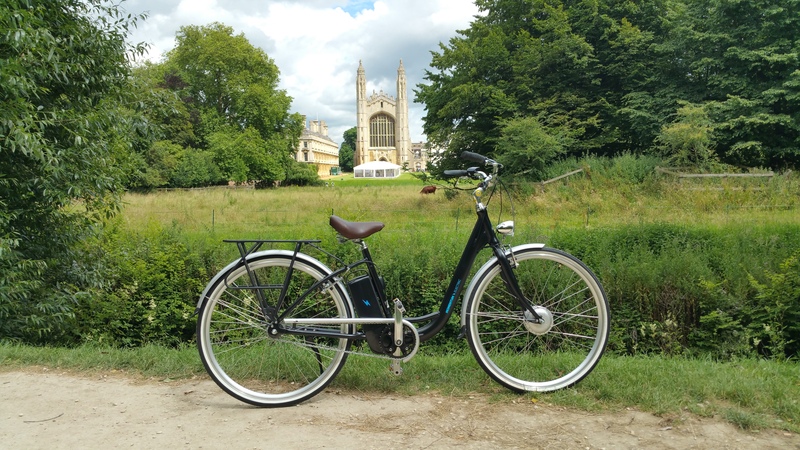 It’s aimed at the urban cyclist, so this model is not built for performance (take a look at its sibling, the Upstart if you’re after a roadster) but it feels sturdy, well-made and there was no rattling. 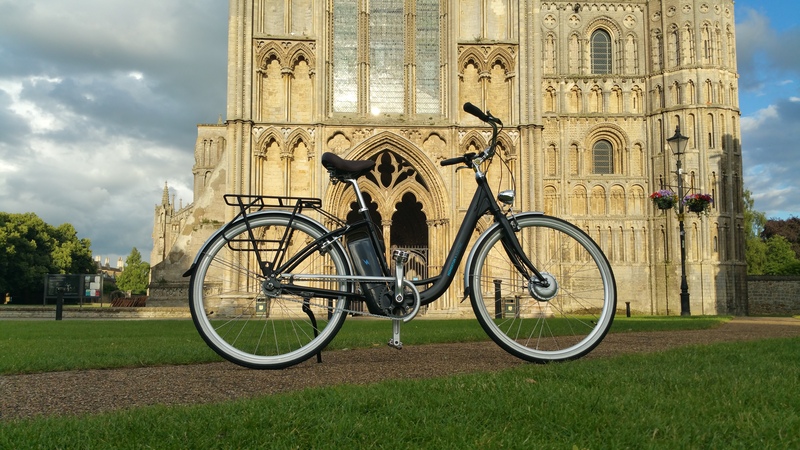 At £1,350 there is a lot of competition, but the Model T puts up a big fight for those in the market for an easy to use e-bike around town. 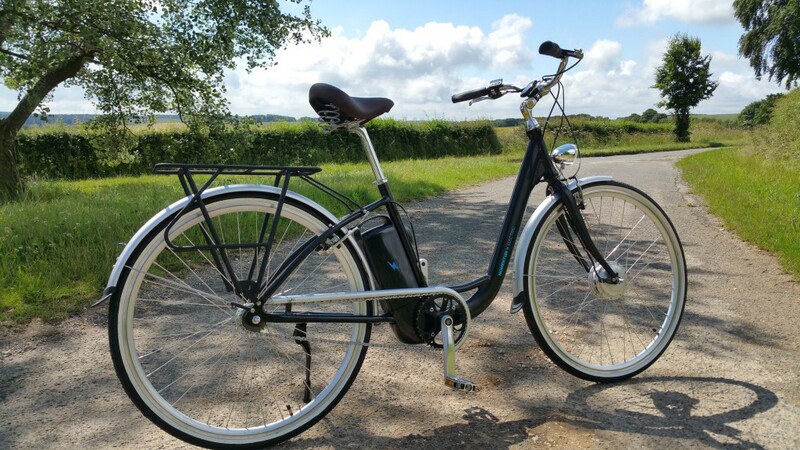 The price point includes a 5 year warranty on the frame, 2 years on the electrics. It’s good to see the battery is included in the 2 years too.As always, with any bike, we strongly recommend a test-ride before splurging your hard-earned cash. You can find links to dealers at the end of this review. Weight: Battery 2.7Kg, Bike 19Kg. Total 21.7Kg. There are a number of stockists around the UK, so there shouldn’t be one too far away in order to book a test ride. There are also dealers in Ireland, Europe and Australia. Spare batteries are available for purchase at £350.00. A spare charger £35.00. We would like to thank Ying-Tsao Tan for sending us the Model T to review.